Boat Description Faced with 2 to 3 foot seas, most boats that offer skinny water access are likely to retreat to the dock or launch ramp. The versatile Triton LTS 240 is different. This is a powerhouse of a shallow water rig thats blue water ready. The visually stunning rig is ruggedly built with stainless steel thru-hull fittings, a big, stable casting platform inshore and a generous cockpit. 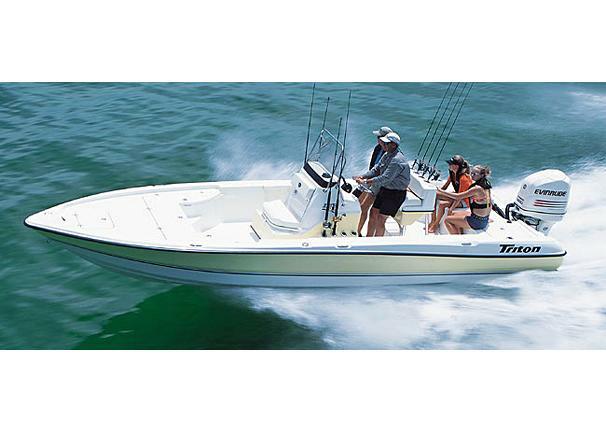 Every square inch of the 24 length is laid out for fishability and fast access to all the gear that supports it. With twin rod lockers, plus in-console and aft storage compartments, theres a load of space to accommodate tackle for both inshore and offshore action  plus a round baitwell to assure that your presentation will be as enticing as possible.